Whether you’ve just finished up a business meeting or you need another day of vacation, make a last-minute travel decision and stay an extra day in Detroit to rest and recharge before you return to your daily grind. We have five ideas to help you spend a day relaxing in the city. You won’t regret it. The best way to relax is with some much-needed pampering. If you’re in downtown Detroit, give D.Tour Spa, Immerse Spa, or Woodhouse Day Spa a call. With treatments that range from detoxifying body wraps to body scrubs and massages, you’ll be relaxed in no time. For hotel and spa combinations, check out the best spas in metro Detroit. You might be staying in the heart of downtown Detroit, but there are plenty of outdoor escapes to soak in the sun and some “me time.” Take an afternoon nap on the lounge chairs along the Detroit River. If you’re looking for an even quieter spot, head over to Belle Isle, Detroit’s island gem with some of the most unbelievable views of the city. Hit the beach. Yes, you read that right. Detroit has its very own beach in Campus Martius Park. You can put your toes in the sand and sip cocktails in the sunshine. This spot is prime for people-watching, too. If you’re the active type, we suggest kayaking on Belle Isle or biking the Dequindre Cut Greenway. You can rent kayaks from RKC Adventures or bikes from Wheelhouse Detroit. Unwind with some yoga at Citizen Yoga, Detroit Yoga Lab, Bikram Yoga, or Essential Hot Yoga. Our Detroit yoga experts will have you feeling re-energized in no time. If you’re looking for something to raise that heart rate, check out Detroit’s high-energy workout spots. Shopping is always the answer. Woodward Avenue is home to the Nike Community Store, Under Armour Brand House, Moosejaw, and Detroit Is the New Black. Find your way over to Midtown to hit up Detroit’s cutest boutiques — Nest Housewares and City Bird. The Shinola flagship store, Third Man Records, and Filson also take up shop in the Midtown area and are must-visits while in the neighborhood. Sit back and relax with a glass of red or white at Motor City Wine while listening to live jazz entertainment. If you’re looking for small plates to pair with your wine, check out The Royce Detroit. Want a bottle to take home as souvenir? Stop in at House of Pure Vin. With their expertise, you’ll be well on your way to becoming a wine expert. If you’re the beer-drinking type, we have tons of breweries in the area for you to get a taste of The D’s beer scene. For German-style lagers, head to Atwater Brewery. Its Dirty Blonde brew is a local favorite. If you’re looking for pizza and beer, visit Motor City Brewing Works. You won’t be disappointed. Conferences are exhausting. 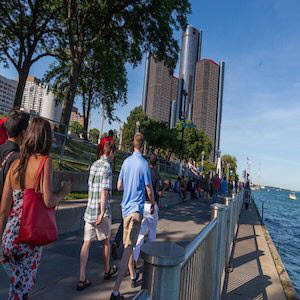 Relax and recharge with and extra day in The D.
Discover more cool things to do in Detroit.